The MODEL 1715 presents crisp Radar echoes in four shades of gray on the 7" Silver Bright LCD. The Radar offers detailed pictures of coastline and targets at short ranges thanks to narrower pulselengths and dual IF bandwidths. The antenna rotation speed automatically changes depending on the range selection for optimum target detection. The compact, waterproof display allows table top or panel mounting in the cockpit or on the open fly bridge. 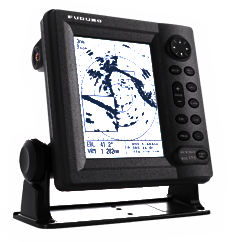 With use of nav data inputs in NMEA 0183 format, the radar offers additional functions. Graphical and numeric waypoint information such as Range, Bearing and XTE can be shown on the display. The waypoint is indicated by a lollipop mark for easy identification on the radar display. In the TLL output function, you can use the cursor to output a specified target's L/L to the optional GPS navigator as a mark.